I have become considerably optimistic about the future of our practice from the evidence of disruption that had been latently present and now is increasing activating our economy. What had been a slowly emerging awareness of the need for doing things in new ways is now attaining greater momentum through the recognition that a fundamental shift has taken place, and that new strategies and designs are essential to successfully get in the flow of new achievement. I sketched a diagram, an emergent equation of sorts, that begins to express some of the shift and its potential in a couple of domains of interest for me. It tries to express that the content of the institutions and organizations of the recent past, which had still been bound up in closed and constrained systems, is breaking out and finding new value through more open and innovative systems. The impacts of this change of state include the collapsing value of the services and infrastructures that sustained the older systems in the first decade of the millennium, and the emergent power and potential residing in the transitional white space between the recent now and the yet-unformed next. Corporations, as individually competitive entities, were essentially closed systems where not being number one or two meant death. They were administrated by hierarchies enclosed in towers expressive of stature, status, and power. The value in these towers was attained through internal controls like efficiency of utilization, and external influences like financial instruments. These real estate values were achieved through a set of services, equipment and standards managed separately from the core purposes of the organization, and yet influenced the shape of buildings and cities. People sat in policy-defined cubes. Furniture manufacturers fabricated responsive and dimensionally-confined systems. And architects and designers influenced site selection and lease negotiations based on "test fits" measuring the efficiency of the ratio of space enclosed in cubes versus the amount of space left over. Developers achieved "investment grade" ratings on their buildings by, among other things, reducing the inches of building constructed between the module of the furniture systems proscribed by the corporate standards and the minimum dimensions of aisles defined by code. Geometric precision defined economic value. Then, a confluence of global comic development, financial meltdown, technology acceleration and the innovation imperative scrambled the value set. Rising real (and artificial) estate costs initiated a quest to squeeze, and "footprint hierarchy" disappeared. Technology enabled a work-anywhere potential, and realistic real estate utilization metrics proved the case for dramatic reduction in real estate demand. Innovation, the key to competitive differentiation and precious growth, was now believed to arise from a culture of creative and cross-disciplinary collaboration for which the cube was an enemy. Even after economic collapse and the disappearance of price pressure on real estate decisions, the demand for space may now be felt more by the coffee shop than the corporation. Leading organizations are now trying to find ways to operate as networked clusters of competencies rather than closed corporations. The concept of work "stations" now only has value if you believe that if you have one you will not get laid off; instead, quality of place and attraction of space get attention. Work, in any case, is no longer contained in a company's buildings, nor by the clock, and is progressively becoming part of a seamlessly networked, diversely urban lifestyle. People now much more agile in place and time, choose places and spaces that are the most effective, or can be made more effective, for whatever activity is part of their workstream. So, what might this mean? Our clients regularly ask us about trends. Understanding what is happening in workplace planning and design, for example, allows them to become current, test their status against industry and competitors, and make more informed choices about their own programs. Trends, a term borrowed from the world of style, may however be evidence more of group-think and less a valid tool for decision-making. The trend-setter may actually have been the only one in the chain who made an authentic move, creatively adapting and innovating their workspace to meet the unique and differential needs of their organization's purpose. His followers may now be experiencing the frustration of trying to fit function to form. In a recently posted video of his presentation at a TED conference, Simon Sinek offers a diagram – "the Golden Circle" – of the path to influential leadership, and a simple formulation that people want what you believe, not what you are. 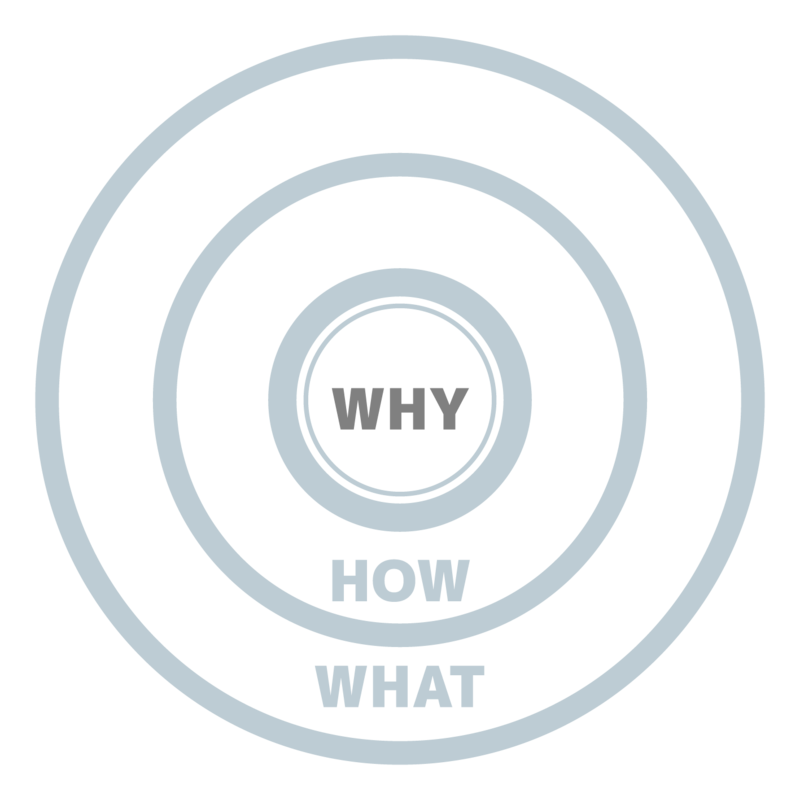 Individuals and organizations with a well-formulated and articulated belief system ("why" – their purpose for being) develop aligned and authentic means to deliver on their promise ("how"). In order for the "how" of their organization to be effective, they shape their presence in place and space in the character of their culture ("what" – the tangible and physical expression of their unique DNA). In their real estate and workplace design programs, aspirational organizations may see the impact and influence of others' space moves and, sensing "trend," may choose a similar approach for themselves, believing they, too, may benefit from the concepts. The trend-setting organization may say – we are relentless in our quest to understand the needs of our clients and their customers. To get this understanding we do our work standing next to them, enabled by technology and support policies that allow our people to work in our client's places. We've developed an agile workplace with all of the tools to support and nurture our highly committed and recognized staff. The trend-following organization sees a "trend" to shed real estate costs through a reduced space inventory and minimized allocations. They initiate a mobile work "policy" and measure their success with a 40% reduction in occupancy costs, which, they believe, enhances their competitive position in the market. Their people begin to experience a high level of stress, make harmful decisions based on the celebrated internal metrics, and cling to a cubicle as an entitlement and an assumed job insurance. If I could apply Simon Sinek's principles to our advice to our clients, I would always propose that we design from the inside out. Developing a deep understanding of the purpose and goals of the organization (the why), we would then begin to shape with them a strategy design (the how) to meet their goals and then begin to uncover, test and develop concepts to shape a design strategy for place and space (the what) to enhance the performance of people and to achieve and sustain leadership in their mission. This is a great time for corporations and other forms of organizations to reassess the purposes and power of place for their own goals and objectives, whether considering new initiatives or reviewing the impacts of past or recent programs.